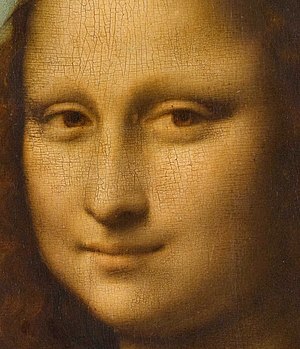 Detail o the face o Mona Lisa shawin the uise o sfumato, pairteecularly in the shadin aroond the een. Sfumato (Italian: [sfuˈmaːto]) is ane o the fower canonical pentin modes o Renaissance airt (alangside cangiante, chiaroscuro, an unione). This page wis last eeditit on 4 Apryle 2017, at 02:51.